The Ocean Grove Sub-branch started life as part of the Barwon Heads/Ocean Grove Sub-branch which was formed in 1948 and had its’ first meeting in the recreational hut in the Wyndean Caravan Park. That Sub-branch functioned for many years in a building known as The Lobster Pot at the rear of the Barwon heads Fisherman’s Pier. It moved to its’ current site in Hitchcock Avenue in approximately 1957. The early and initial moves to establish an Ocean Grove Sub-branch came in 1959. An application was made to the Shire of Bellarine for permission to develop the triangle of ground bounded by The Parade and Hodgson Street to establish a suitable memorial stone. Council readily agreed to this proposal, subject to the approval of C.R.B and the National Safety Council. This was ultimately granted with some restrictions. The area is now known as The Ocean Grove Memorial Triangle. The stone monument was found in Geelong after much searching, the flagpole was donated by Jack and Evelyn Skinner and the flag was given by the Country Womens’ Association. The first meeting that proposed the formation of the Ocean Grove Subbranch was held on 7 Dec 1961. The proposers were E. J. Anderson,A. V. Sherriff, F. Gray, G.C. Beavis and C. Urquhart. Also present by invitation were I. A Stewart and E. R Carroll, President and Secretary of the 43 District Board. Mr Stewart chaired the meeting which duly elected the Officer Bearers of the new Sub-branch. Most Sub-branch records have been lost from approximately 1962 onwards and it is believed that in 1970 the Sub-branch occupied a rented property in the clubrooms of the Ocean Grove Football and Cricket Club in the grounds of the Memorial Reserve. The premises were barely adequate and were shared with other organisations. The Sub-branch made a numbers of attempts to move to other locations, however, there was a general reluctance to shift. In March 2008 and as a result of discussions, Ocean Grove Bowling Club provided the RSL Sub-branch with access to suitable facilities now affectionately known as the home of the RSL Sub-branch. 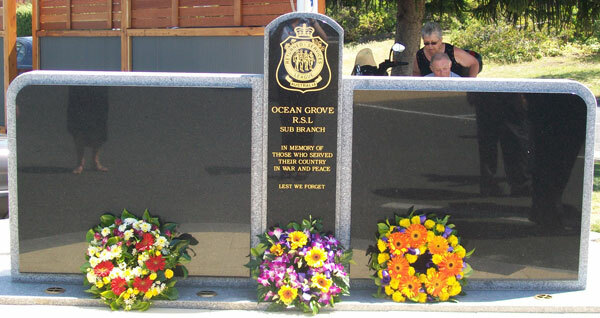 It is said that ‘life does the full circle’, and in this case it is true, On the 1st September 2011, Ocean Grove and Barwon Heads RSL sub branches amalgamated and became the Ocean Grove Barwon Heads RSL sub branch for which the Bowling Club in Ocean Grove is the sub branch home base. On 19th September 2011, the new Charter was presented by Colonel Michael Annett CSC, CEO of RSL Victoria. Members of both sub branches welcomed the transposition and look forward to successful future development. Ocean Grove Barwon Heads RSL sub branch boasts a membership of some 200. Click on Link below to download Barwon Heads RSL history.